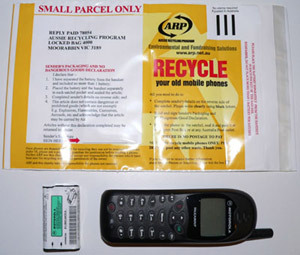 Australians should recycle their old mobile phones, says the Australian Mobile Telecommunications Association (AMTA). A spokeswoman for the AMTA’s MobileMuster program, Rose Read, said mobile phones contained many valuable metals such as gold, silver and nickel as well as plastics. Every 50,000 handsets yield about one kilogram of gold, Ms Rose said. “More than 90 per cent of the materials in mobile phone handsets, batteries and accessories can be recycled into new products such as jewellery, fence posts and stainless steel. Mobile phones that are not damaged or too old are cleaned and repaired. They are then sent for re-sale in developing countries , which currently have little modern infrastructure. All other mobile phones are environmentally recycled, with component parts available for re-use in items like jewellery and copper piping, the nickel obtained from batteries can end up being used to make stainless steel products such as saucepans. Plastics are granulated to produce items such as traffic cones. This is a great post Neerav. Thank you. I was not aware that this service was available. I hope, for the sake of the environment, that your page receives huge numbers of hits! I have two kids and thus 8(!!) phones to recycle. I actually rang the 1800 number on the website because I wanted to talk with recycling people. They asked where I heard of their service and I gave them your web url. They were delighted to hear that you had written a piece on them. EDITOR: lol, 8 phones! they must go through them faster than shoes. Every hour, 1,700 mobiles are dumped by Britons buying better ones to take advantage of offers from the networks. This accumulation of dead ringers is an onslaught on our ecology: 15 million phones, each bursting with toxic chemicals, are thrown out to be buried in landfill sites or left in drawers and cupboards. ‘We are creating a dangerous legacy, given the incredible rate of new devices dumped daily,’ said Alison Conboy, one of the designers of an exhibition on the future of mobile phones, Dead Ringers?, at the [British] Science Museum this week. I work for a rubbish removal company and we used to see a surprising amount of mobile phone chucked away. Over the last couple of years that has declined which is ironic as you would think that the number of phones on the market has increased several fold. All I would say is that I think the message is getting across. My wife’s company has a mobile phone recycling ‘lady’ at work and my kids are fully aware of the need to recycle too. I think that everybody should do their part in preserving the environment. With more and more mobile phones being released each year, it would be crucial for consumers as well as manufacturers to do something about recycling these electronic wastes instead of dumping them into the garbage. There are only sites today that can give you money in exchange for used phones. But of course, it would be better to give the monetary value to charities.